In 1991 in Geesa v. State, the Texas Court of Criminal Appeals accepted the federal jury charge instruction of Proof Beyond a Reasonable Doubt, namely, that reasonable doubt “is the kind of doubt that would make a reasonable person hesitate to act in the most important of his own affairs.” Trial courts routinely instructed juries on that definition in the court’s charge. Almost ten years later, the Court abandoned the Geesa instruction as unworkable and determined that juries should interpret the phrase “Reasonable Doubt” as they saw fit. While the Geesa instruction no longer applies, the Court in Fuller explained that the Proof Beyond a Reasonable Doubt standard at least constitutes a more onerous standard of proof than Preponderance of the Evidence and Clear and Convincing Evidence and that it is proper for counsel to explain the standard in light of these other less demanding standards of proof. During voir dire, I often display a diagram with the familiar “Stair-Step” illustration that provides the statutory definition for Clear and Convincing Evidence and graphically contrasts how each legal standard, from Probable Cause to Proof Beyond a Reasonable Doubt, requires a higher degree of evidence to convict. While the Stair-Step Illustration offers a choice of moving or not moving from one step to the next, jurors might interpret it to mean that once they have moved up they cannot move back down. The Stair-Step illustration also inadvertently causes jurors to associate climbing to the next highest rung as success. The natural inclination for the defense is to think of climbing the Stair-Step as an outcome to be avoided. The Evidence Gauge illustration uses a red needle that moves from left to right over a series of PowerPoint slides to help distinguish different standards of proof and levels of certianty. 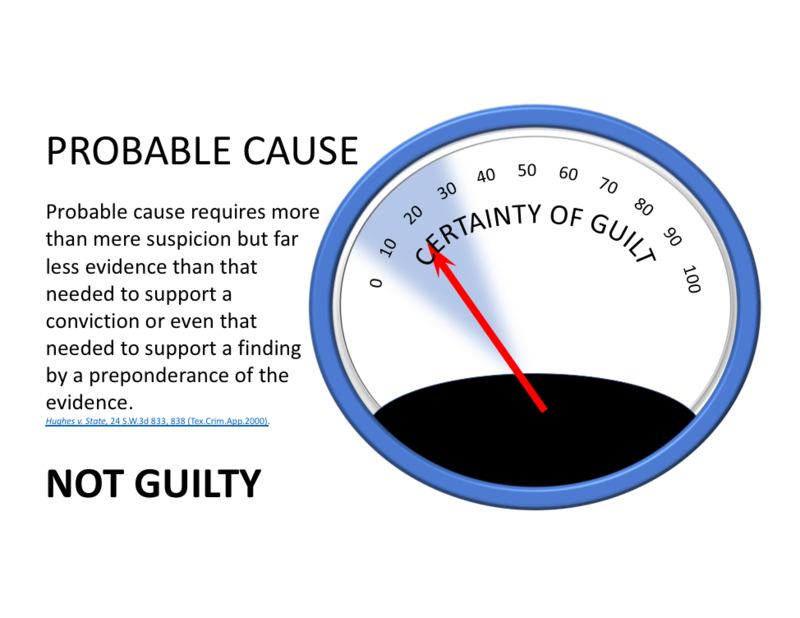 Each slide shows how the needle can move across from left to right, i.e., from No Evidence to Probable Cause, and from there to Preponderance of the Evidence, Clear and Convincing Evidence, and finally Proof Beyond all Reasonable Doubt. The Evidence Gauge accurately suggests that standards of proof are fluid. As with a pressure gauge, Jurors might imagine a needle that moves too far to the right as moving into the danger zone. Since the jurors will not have heard any evidence prior to the commencement of trial, the defense will explain that the needle is sitting idle at zero. Once trial begins, the needle may move to the right depending on the strength of the evidence. After cross-examination, the needle may move to the left and so on until the end of the trial. 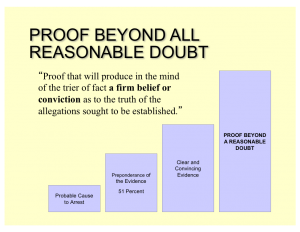 The defense may argue that the needle might move into the Probable Cause or Preponderance of the Evidence zone but never approach Proof Beyond a Reasonable Doubt. What is critical for the jury to understand is that they cannot find the defendant guilty unless the needle has moved almost all the way across to the very far right.The Evidence Gauge may also help with strikes for cause. Jurors are often reluctant to admit that they will secretly consider the defendant’s silence as evidence of guilt. Jurors say that while it will be hard, they will try their best not to let the defendant’s silence enter into their deliberations. When pressed by the judge, those same jurors say they will follow the court’s instructions. The likelihood is that they will not. 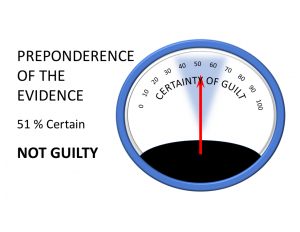 Those jurors however may feel more comfortable admitting that the defendant’s silence would “move the needle slightly” from Preponderance of the Evidence zone to the Clear and Convincing Evidence zone. Even without saying they would more likely convict, referring to the movement of the needle is a better way to express their true feelings about being unable to follow the court’s instructions.